The reason of my last homemade chilli oil post was to make dan dan noodles. 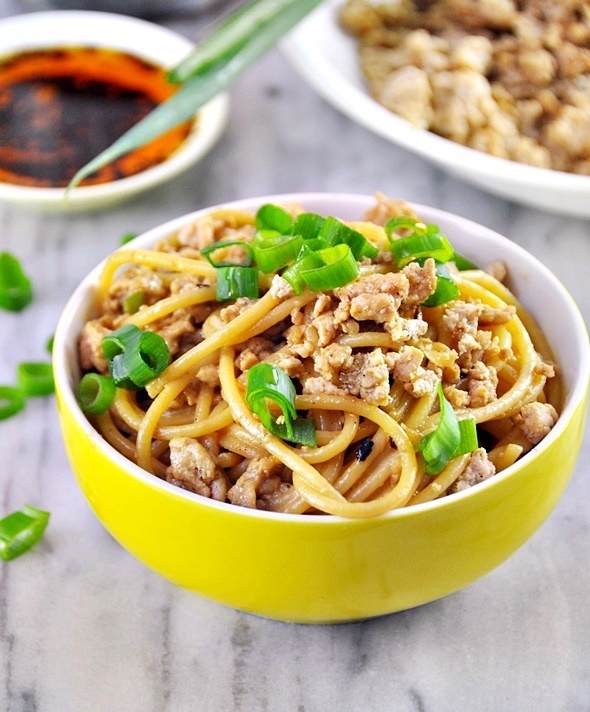 It is a popular Chinese Sichuan dish which is essentially made up of noodles with creamy sesame and chilli oil dressing as well as a sautéed mince meat. My take on this dish is a little different than the original version. 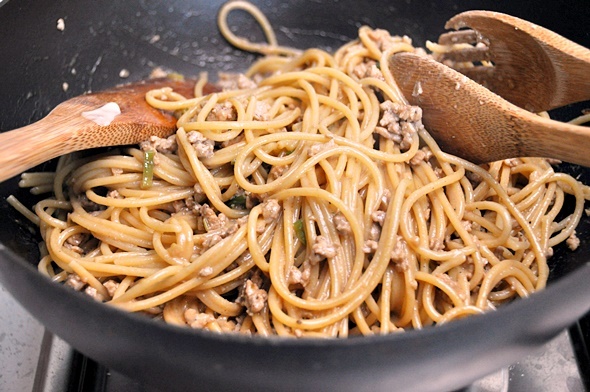 There’s no sign of Sichuan peppercorn and it is therefore less spicy; instead of using dried Asian noodles, I have substituted with something most of us is familiar with – spaghetti. 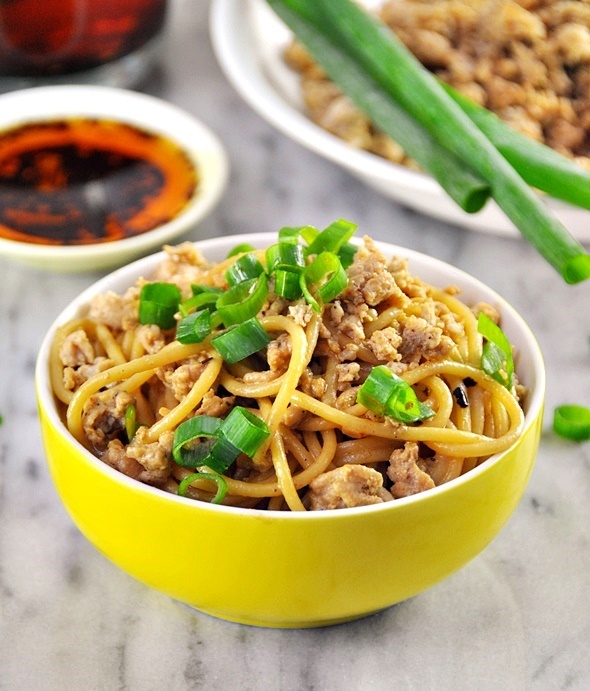 Expect sweet, savoury and nutty flavoured noodles with a subtle kick from the chilli oil. A more palatable option for those who have a lower threshold towards chilli – a far cry from the traditional Sichuan dishes that are well-known for mind blowing and tongue numbing pepper filled flavours! So this is it, the east meets west version of dan dan noodles. Please enjoy! In a large pan, add cooking oil. When the oil is hot, add mince chicken and pepper. Saute until golden brown. Season with light soy sauce to taste and a couple drops of sesame oil. Transfer to a plate and keep warm. Wash and dry the pan. Add a teaspoon of oil. When the oil is hot, add garlic and the white section of the spring onion and saute until aromatic. 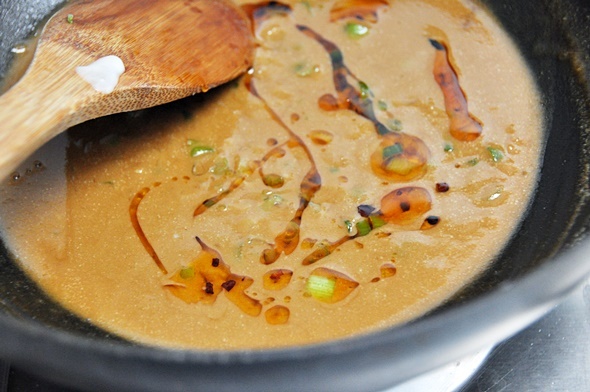 On very low heat, add tahini, sweet soy sauce and hot water. Stir until well combined. 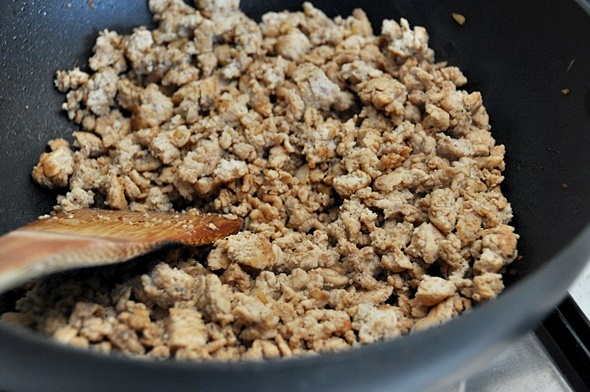 Don't be alarmed if the tahini appears to be "curdled" initially, just keep stirring as the mixture will become smooth. Stir in chilli oil and season with light soy sauce. Keep warm while you cook the spaghetti. Cook the spaghetti according to packet instructions. Drained. Toss the spaghetti and mince chicken into the sauce until well combined. Garnish with the green section of the spring onions and serve immediately. I wanna try this Dan Dan Noodles after my vacation in Nowra Australia.. It is interesting.